Amazon and Etsy are two of the most popular sources of content on Pinterest. Time to monetize? Zoomsphere, a social media statistics tool, is now giving users a little bit of insight into the most popular sources of content on Pinterest. Vying for the number one spot are Google and Etsy. At the time of writing this, Google is in the number one spot for daily pins, but that could change at any minute. On average, both Etsy and Google are the source for roughly around 20,000 pins in just one day. Looking at the monthly statistics, both sources have over 100,000 pins, but Etsy barely edges out Google by just over 200 poins, coming out at the top of the list. Etsy and Pinterest are a match made in heaven, and the e-commerce site has an active presence on the social media site, which may have something to do with the fact that it’s such a popular source for images. 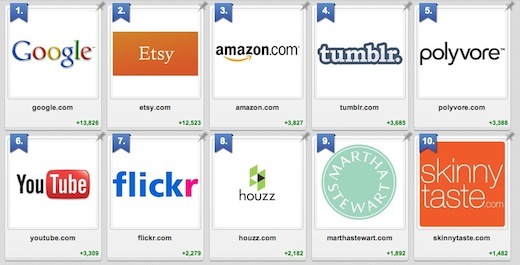 Etsy’s Pinterest account is the second most followed brand on the social network, with over 60,000 followers. Etsy currently has 30 boards with almost 1,000 pins shared with its followers. Coming in a distant third place is another e-commerce site, Amazon, with over 32,000 pins per month. The fact that two of the top three sources are e-commerce sites is undoubtedly a sign of how Pinterest can monetize its service, if it so chooses. Of course, there are other services like The Fancy, which we covered when it first launched back in 2010, which have beat Pinterest to the punch. The Fancy encourages users to share their favourite products, and merchants can then ‘claim’ those products, after which they can be purchased through the social network. Tumblr is the fourth most popular source of content, followed by Polyvore and YouTube. It’s not surprising that YouTube is the only video-sharing site in the top 10, since it’s the only site which allows you to embed the video itself onto your Pinterest boards. All other video sharing sites, including Vimeo, feature links to the video but they can’t be played on Pinterest. Flickr is the seventh most popular source of content, although we can imagine that it’s place in the top 10 will drop with time, since the photo-sharing site made the move to block the ability to pin copyrighted content. The last three spots are taken by Houzz, Martha Stewart, and Skinny Taste. If you’re curious to find out how what kind of content is being shared from your site on Pinterest, just go to ‘pinterest.com/source/url/’ – where url is the your website’s address. So for example, if you wanted to know what kind of content is being shared from The Next Web on Pinterest, you’d just go to pinterest.com/source/thenextweb.com. Read next: Would you rather type a brand name to skip a video ad? Solve Media thinks so.